We are all still reeling from the double eviction of Sarah and Kenny in a one two punch by the Sloppy Seconds. No one is more shattered than poor Sabrina who in the last two weeks has watched her alliance either walk out the door or flip to the other side. Even Allison who was siding with the Sloppy Seconds to save her skin now feels forced to be one since the numbers are on that side of the house. We left off watching the How We Roll HOH competition. It’s a game of patience, skill and steadiness. Everyone is finding it challenging. Once you got a ball in its spot the challenge then became trying to keep it there once foul move and it slips off or gets knocked off by another ball. The competition really was only between Jon, Arlie and Adel. Adel almost took it early then one of his balls took out pretty much his whole board and he had to start over again. Arlie was well on his way to winning as well now that he is actually trying to win. Jon ended up being victorious and is the 8th HOH of the season. I don’t think I’ve seen a season where we haven’t had a repeat HOH by this point. Once the competition is over the sloppy seconds celebrate all over the house. Neda and Heather celebrate in the storage room while Jon and Arlie retreat to the bedroom. Jon and Arlie decide it should be “The Gremlins” Rachelle and Sabrina on the block. Sabrina cries for her friends Sarah and Kenny while Rachelle says she is sad but the girl never has any emotion in her face or eyes, so it really is hard to tell if she is feeling anything. We also learn through the HOH reveal that Jon is a closet One Direction fan. I’m not judging here, I like them too, and I’m a grown up. My defence I have young kids, when you are forced to listen to something enough it begins to grow on you! Sabrina is distraught and wants to talk to Arlie. She feels stupid for how she played the game and Arlie is listening to her and is pumping her up. He is telling her everything she wants and needs to hear. Half this game has been spent trying to keep Sabrina on an even keel. She is great when she feels in control and secure, but the minute she doesn’t she become and emotional wreck. He tells her she was playing an awesome game up til week 5 and everyone can see that. Really, all Arlie wants is her vote from the jury house so he’ll tell her anything to stay on her good side. Rachelle and Sabrina go up to the hot tub. They come up with a plan to save themselves, and on cue Jon enters the hot tub area. The girls tell him that if he keeps them they will get rid of Arlie and Adel. They will be his puppets and vote however he wants. Sabrina points out that as long as they are in the house, they will be the target, once they are gone that targets shifts to him. Jon reminds them things can change in 24 hours and he wants both of them to come back to him together before the nomination ceremony. We actually get a Have/Have Not competition this week. We are playing Mega Beer Pong, and its BB Tech vs BB University. Each team takes turn shooting into each other teams cups. If they get it in that cup gets taken away, if the cup has a star a player gets eliminated. The team that loses a cup has to drink a beer. Only in Canada does the challenge actually involve drinking a beer during the challenge. The team that loses all their cups first are Have Nots for the week. The winning team gets to participate in a frat party. Rachelle, Arlie, Heather and Neda are the BB Tech and Jon “Beer Pong” Pardy, Sabrina, Adel and Allison are the BB University. BB University dominated the challenge and it came down to Sabrina and Rachelle. Sabrina had 4 cups and Rachelle had 1. Rachelle made a good comeback but Sabrina managed to sink the final shot and win the competition for BB University. Rachelle, Arlie, Heather and Neda are have-nots for the week. 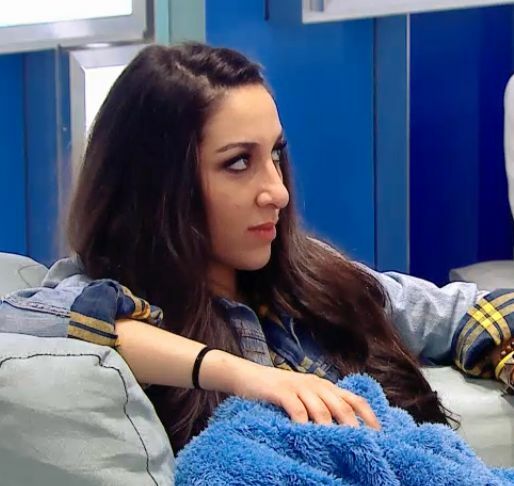 Neda is mad at Jon because he had said he’d throw the competition to her because he wouldn’t be a have not anyway since he’s HOH but once there was beer involved he changed his mind. The Sloppy Seconds are in the HOH room and they are talking about how all the condiments are gone. Jon is a bit tipsy from the Beer Pong challenge and,Jon decided that he should confess to them that he did it, so he said he poured the maple syrup down the sink. He looks over at Neda and she is giving him the stink eye, so he thinks she is mad that he’s taking her credit. Jon then tells everyone that it was actually Neda that did it and goes into detail about how she threw everything in the garbage to weaken Kenny. Neda is still angry. They are talking alone in the bathroom and Jon doesn’t get why. She tells him how he is ruining her game. Her game being looking like she has no game. Jon told her he just thought it would be funny. Typical man! We are formally introduced to the Goof Troop. The Goof Troop being Arlie and Jon. Jon tells us this is his plan B alliance if him and Neda fall through. They agree that the need to look out for each other because together they are strong but if one gets evicted the other is right behind them. Their only chance of making it to the end is to stick together. Jon tells Arlie that he can control Neda’s vote, but Arlie doesn’t buy that. He knows that Neda will vote how she wants to vote. Neda and Rachelle are having a conversation of their own. Neda is not so loyal to the Sloppy Seconds, and wants Rachelle on her side. She would prefer Sabrina out first or back door Allison. This gives Rachelle some hope and she reminds Neda that she can rock any endurance challenge. Rachelle and Sabrina go back to Jon for their final pitch. They tell him that Arlie and Jon are each other’s biggest threat, and that if he keeps them he is guaranteed 2 votes, Rachelle is going to do well in endurance and they will get out the strong people Jon can’t touch. He listens and takes it into consideration. In the end Jon stuck with his original decision and nominated Sabrina because he thinks her loyalty begins and ends with First 5 and he can’t believe anything she says and Rachelle because she put all her eggs in Sabrina’s basket. Do you think these nominations will stay the same. I am 100% sure that something else is planned, but we shall see. We are now entering the jury phase of the season. Do you think the jury will be bitter? Is it made up of the people it should be made up of? Comment below and let me know what you think.